If you have TRVs at home already, then for around the £50 mark, you can replace them with an e-TRV, and start making savings on your fuel bills. We caught up with e-TRV at the 2011 Home Technology Show to find out a little more about these smart heating controllers, how they work, and how to install them. We hope to be able to bring you a hands-on review of the e-TRV solution in the not-too-distant future, to find out how easy they are to install and to use. In the meantime, take a look at the e-TRV website for more on the product, or take a look at the following YouTube clip for more. Electricity meters have become very prevalent, but people have very little control over seeing what gas they're using and when. We've been doing some studies into that which are very enlightening on how much energy is used in gas for heating homes. In fact, it's around 58% of the energy used in a house relates to heating, and yet most people are concentrating on low-energy lightbulbs, which are using a fraction of the energy of your overall home. So heating bills are becoming very dominant and very relevant for people to manage better. And of course, at the moment we're seeing this hideous 20% increase in fuel prices going through, so anything we can do to keep the bills down. Now, what I'm looking at here - it looks a little bit at first glance like one of these sort of plug-in air freshener thingies. I'm clearly wrong with that, aren't I? So just explain what I'm looking at here, please. Okay, Pete. Well, this is an eTRV. 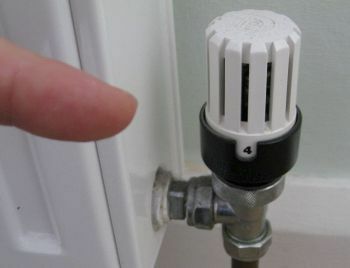 People generally on the end of their radiators have thermostatic radiator valves, which is shortened to TRVs, for thermostatic radiator valves. This is an eTRV, which is an electronic thermostatic radiator valve. This has been British-designed and British-manufactured and we have a patent in the UK that enables you to undo your existing TRV from a radiator, that's a DIY job, and to fit an eTRV directly in place. And this is something that you do yourself - you're not expecting some professional fitters to come and install it, it's just a case of getting the old cap off and putting this on? Well, provided you've got a TRV already, then it's a DIY installation. If you don't have a thermostatic valve already in place, then you made need a tradesman, heating engineer to come and help you fit that, unless you're confident at draining down a heating system yourself. But if you have a thermostatic valve with one to five on it already, it's a direct swap and it takes about a minute to fit. Superb, okay. I'm going to turn now to Anita, who's going to give me a quick demonstration of this, because obviously this fits on the radiator control, and it comes with a little infra-red remote control - is that right? That's right. It's just like your TV remote control - it's point and shoot. So can we just - with the demonstration unit we have here, just take a look at this, and show me how, for instance, I'd programme one of these? Basically, you've got three pre-set programmes, one, two, or three, with different timetables on. You choose the one you like. If you don't like any of those, you can set up your own one, and it's basically just a question of pressing the set button, programme one (if you're choosing programme one), and set again, and that's it - it's that simple. So what can I actually set with this? Can I set the temperature at a particular time of day, or that sort of thing? Yeah, you can do exactly that. You have the choice of three different on/offs per day, so you can have, in the morning when you get up and your bedroom, you want it nice and warm; during the day, you're at work, so you can have it on a low setting; and then in the evening, when you go to bed, you might want it slightly warmer than during the day, but not as hot as at night. So you've got three different settings a day, so you've got really close, accurate controlled heating when you need it. So what I have at my house at the moment is, we have our thermostat set to about, I don't know - 22, something along those lines. We have one room that's freezing, and my little cubbyhole upstairs is baking, and obviously I've got no way of independently controlling them, other than twisting the knob. That would solve my problem - is this right? Completely and utterly. You're going to get digital control, very close control. You can have a different time in your little cubbyhole and temperature to the one in your downstairs, and you choose which temperature you want it to be at. It's going to be spot on. Wow - okay, I'm very impressed. Barrie, I'll turn back to you - have you got any figures that demonstrate how much this can save? When we launched the product, we said that there's a realistic potential for 25% energy savings. We tried to establish a portfolio of houses that we could test this on, and we found a gentleman called Chris Gare, who's been monitoring his gas consumption for the last three years, and the outside temperatures on a daily basis. We asked Chris if he'd like to fit eTRVs into his house, and he agreed to, but he said he was sceptical about achieving any energy savings. Since then, he's published his data, and he's made a 23% energy saving on his gas use through exchanging his existing TRVs to electronic TRVs, and this was a man who was already motivated to save energy in his house. Has he published this data online somewhere? Yes, if you Google "Chris Gare", I think it's www.gare.co.uk, and you can link to his home heating experiments and see what he's done, where he's been monitoring his gas meter, a little bit like you mentioned with the electricity meter, and he was frustrated by a lack of data, and he's absolutely delighted with what eTRV has done for him. We've also had some commercial success, where eTRVs have been applied in halls of residence in student accommodation in universities, and our customers tell us that they're achieving a payback in less than nine months, so that's a worthwhile investment on anybody's money. Superb, and talking about the payback element of it, how much is it going to cost me to equip my house with these? Well, that will depend on how many radiators you have, and where you see the benefit of applying them. You can buy as many or as few as you require. Most of our customers are buying one or two for areas that they see the advantage is, and then expanding the system into other areas as they see fit. So this isn't unlike other systems, a £500 entry level; you've got a £50 or under £50 entry level for the first valve, and then you can expand the system as you see fit. So we're talking £50 per unit? Yes, and for that at the moment, we currently have a promotion running, we're giving you a free handset and free UK delivery. Very nice. So if I want to equip my house before the winter, where do I go to find out more? 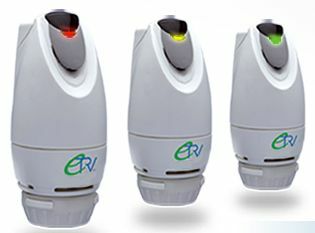 If you go to www.etrv.co.uk., there's a link there to our own web shop, or a number of distributors who offer specialist products. For example, we have people with green energy shops who can offer you other gadgets to help save you energy, as well as eTRV.